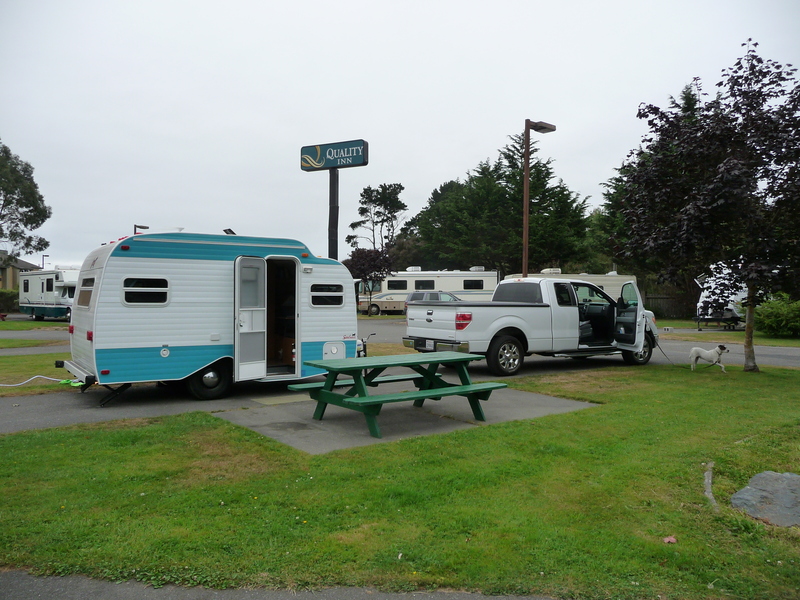 In order to fully explore the Arcata-Eureka area, we spend two nights in the Mad River Rapids RV Park. Whatever this campground lacks in scenic appeal, it makes up in modern amenities. In the camping universe, we’ve found this to be a common tradeoff: state and national park campgrounds usually offer peaceful campsites in scenic natural settings with only primitive amenities, while private campgrounds and RV parks tend to pack tenants cheek to jowl and offer a full menu of conveniences: electric, water & sewer hook-ups, free showers, laundry facilities, and even swimming pools and convenience stores. Morning dawns cold and damp (again), and I cannot face spreading my yoga mat out next to our rig in the chill morning on the available patch of dew-slick ground in full view of dozens of other trailers. But I am determined to practice, and obtain permission to use an unused room adjoining the campground convenience store. The carpet smells damp, and a large floor fan rumbles in one corner, but it’s still better than a public display on wet ground, so I stay. In the college town of Arcata, we explore Tincan Mailman used bookstore, stroll around the town’s central plaza and lunch at a local pizzeria. Locals seem friendly and down-to-earth. Presumably, the pace of life here is more relaxed here than in the San Francisco Bay Area—maybe even more laid back than on the Central Coast. Old town Eureka surprises and impresses us. A large, colorful harbor, Victorian architecture—sometimes outrageously ornate—and an historic central square surrounded by views of marsh, forest and farmland. Not far from our campground, narrow lanes lined with wild radish lead to the shore where the Mad River meets the sea. Basil races over the dunes to the water’s edge. Excited by the wind and wild surf, he runs around in circles like a crazy dog. We three trudge far down the beach, then scale the dunes and return along the river. The sound of birds in the undergrowth. We follow a trail that winds through tunnels carved in the brambles past monkey flower, potentilla, purple asters, pale lemon beach Lupin and tall stands of thistles gone to seed.